Accumulation: The buying of shares as price remains in a small range. Significant accumulation usually leads to a breakout or bullish reversal. Acquisition: An acquisition is a corporate action in which a company purchases another company. Payment for an acquisition can be in cash or equity. After Hours (AH): The time period after the market close that allows investors to trade. Extended hours trading has lower volume and is much riskier. The after hours session is usually from 4 PM - 8 PM ET. Alerts: Trade alerts that notify investors of a long or short investment opportunity. All or None: An order by a buyer or seller to fill the order completely or not at all. You will not get a partial fill with this transaction. Analyst: An expert in evaluating securities and the market state that conducts extensive research and recommends a rating for certain stocks that may or may not provide an upcoming opportunity. 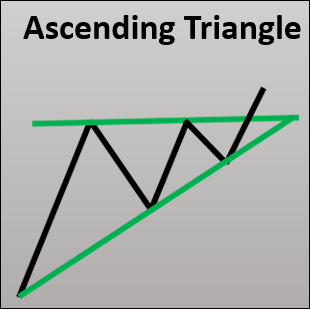 Ascending Triangle: A pattern formed by a converging resistance level and upward trend line. When the stock price breaks above the resistance level, it signals a bullish continuation. Ask: The offering price from sellers for buyers. If you place a market buy order, then you are likely going to be filled at the asking price. Average True Range (ATR): An indicator that acts as a measurement of volatility and range. A low ATR indicates a range-bound stock. A high ATR indicates that a stock is showing relative strength/weakness and may be overextended.